We start with a list of your current families to see what makes them tick. We match up to 1,500 attributes. To start, we just need basic contact information from your current families. Using your current family list, we build a lookalike model of the top traits of your families to see what characteristics are most important. We match the modeled information to an acquired list of consumer and public data in the geographic area of your school. The data reveals the families in your community that most match the families already in your school community. We rank the families to give you the most relevant prospects for you to reach out to. 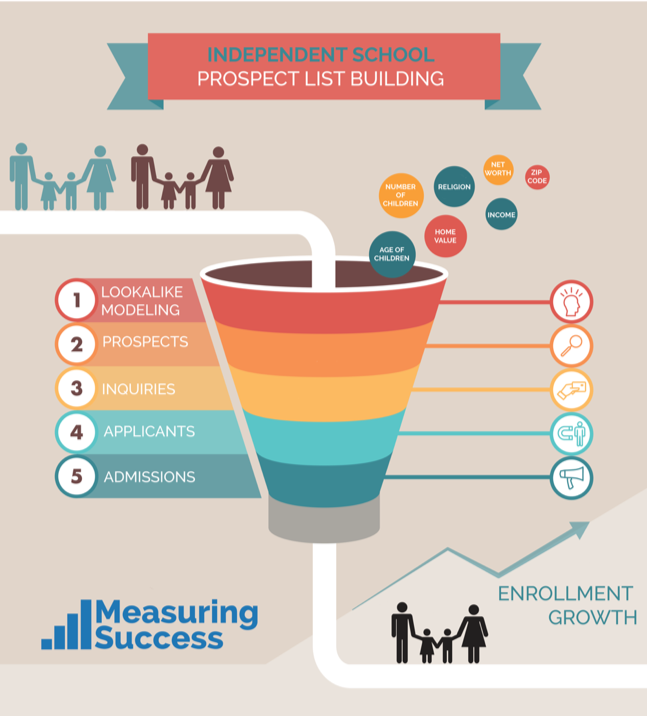 Once we identify the best matched prospect families, we can help you understand what motivates their shcool choice decisions (and their perceptions of your school). By understanding what motivates prospective families, you can use that to craft targeted value proposition statements and communicate with market segments on issues of importance. The list includes verified email addresses of the target families. Use value propositions and email to target specific market segments. Parent ambassadors help word-of-mouth outreach in their area. Using identified interests, invite prospects to open houses and wow events. Enroll new students and keep existing families. Let's set a time to talk. It's a no-cost, no obligation consultation.